Flutes from Altus, the modern masters, are in the tradition of Louis Lot, the famous French 19th Century Maker, who is viewed as the Stradivarius of the flute. The Bennett scale, combining traditional tonal qualities with modern dynamics. Superb Japanese craftsmanship and finishing ensures the player of a well-designed flute, which is exceptionally well made. The Altus mechanism is forged. 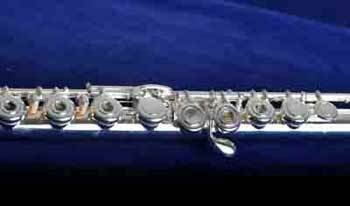 This means that it is strong and durable, which means that the flute will not develop regulation difficulties and is aesthetically similar to the Louis Lot. In addition to the usual gold and silver alloys, the Altus range offers a number of metal options including the 958 Britannia silver and the famous seamed French tube option as originally built by the old French flute makers, notably Louis Lot. Altus represents superb workmanship, design and flexibility in its material use which is often not available from other flute makers. I offer the Altus model S and Z headjoint and also the MCB Pattern headjoint. All Altus flutes on this page have been repadded with Straubinger pads to ensure highest levels of performance and reliability. 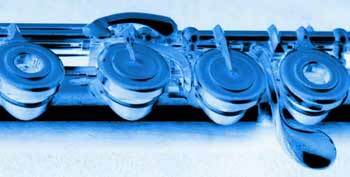 All Altus flutes are optimized to offer enhanced performance. This takes place prior to sale. The instruments carry the manufacturer�s warranty and my two year warranty against faults in adjustment inclusive of free servicing during the two year period. Azumi flutes are the intermediate range from Altus. The headjoints, tube and scale are the same as the Altus range. 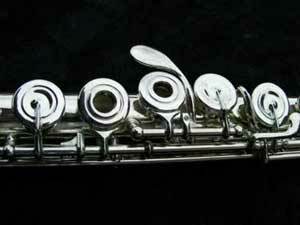 No other maker offers 958 Britannia silver as standard on an intermediate flute. All Azumi flutes sold by myself are enhanced with after-market hand-finishing, selected and voiced Altus Z cut headjoints and are padded with Straubinger pads. These flutes then achieve professional performance levels at an intermediate price. The Bennett scale, combining traditional tonal qualities with modern dynamics and intonation. Superb craftsmanship and finishing ensures the player of a well-designed flute, which is exceptionally well made. The Azumi mechanism is built to the commercial pattern. This means that it does not have the decorative French arms of the Altus. It is forged and thus holds adjustments very well. Azumi represents superb workmanship, design and flexibility in its material use which is often not available from other flute makers. I offer Azumi model with Altus Model Z headjoint and also the MCB Pattern headjoint. All flutes padded with Straubinger pads.